When Beau and I visited Portland, OR we almost stayed! Portland is incredibly pet-friendly from the large selection of luxury, pet-friendly hotels and restaurants to the many interesting and varied pet-friendly activities including museums, bi-plane rides, and cross-country skiing…there’s always something to do in Portland with the Pup. We discovered so many fantastic things to do but our favorites are featured here. Without a doubt, my favorite meal over the course of the entire cross-country road trip was in Portland in the Pearl District at 50 Plates, 333 NW 13th Avenue, 503-228-5050. 50 Plates offers outdoor porch dining that welcomes well behaved, leashed pups. The chef de cuisine at 50 Plates has mastered the art of simplicity while at the same time presenting sophisticated temptations to the palate. 50 Plates is a ‘do not miss’ if you are in Portland! Another chance to nibble the kibble with your pup is available at the three Lucky Lab Brew Pubs located all over Portland. Famous for its brew pups, Portland doesn’t want to leave your buddy out of the fun! Your leashed pup is welcome to accompany you on the outdoor patios for brew and bones. Visit the website for locations. As I mentioned above; lots to do and see by way of pet-friendly activities but not to be missed if you are in Portland in the Fall is the Corn MAZE 16525 NW Gillihan Road Portland, (503) 621-7110. Celebrating its twelfth year in August of 2010 you can look forward to a 1.5 acre maze cut into the cornfields to return for another season. The Pumpkin Patch is located on Sauvie Island, just 15 minutes from downtown Portland. Pets are welcome in the corn MAZE if property leashed and have the proper clean up materials. (However, they are not allowed into the Field of Screams...it must be too scary!) Another seasonal gem is the Diamond Lake Cross Country ski trails. Diamond Lake resort high in the Central Cascades has over 10 kilometers of groomed and un-groomed cross-country and snow shoeing trails and most are pet friendly. Visit their website for more information. As always, please bring appropriate clean up materials and plenty of water for both of you. This is of course a seasonal activity and dependent upon snowfall levels. You may also want to give some consideration to an appointment with your vet prior to your visit to discuss preventative actions you can take to protect your pet’s paws from extended exposure to the cold. For more great pet-friendly resources in Portland visit the Portland Pooch and PDX Dog websites. After a full day of playful fun, Portland’s portfolio of luxury pet-friendly hotels is hard to beat. Two of our favorites though are sister hotels; Hotel deLuxe and Hotel Lucia. Both provide a wonderful pet welcome amenity. 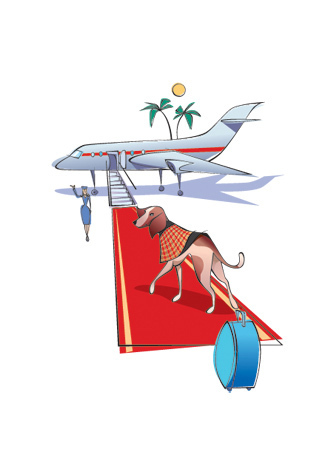 Hotel deLuxe offered one of the best, most thorough pet amenity programs we have experienced. Upon arrival in the room we discovered two bowls, a pet bed, a squeaky toy, a bag of treats, and a couple of clean up baggies. In addition, there was a personalized note addressed to Beau and inside was a clearly outlined hotel pet policy, a list of area things to do that are pet-friendly, and a pet room service menu (Beau devoured the "Smothered Comfort"...turkey and gravy plate). At Hotel deLuxe the theme is Hollywood Glamour and each floor of the hotel features wonderful black and white photographs of actors and actresses from the heyday of Hollywood. It's a great little piece of eye candy to stroll the hallways. Hotel Lucia also features an impressive pet amenity and photo collection however, this time it is the most complete collection of works by Pulitzer Prize winning photojournalist, and Portland Native, David Hume Kennerly. Both hotels are incredibly unique but equally wonderful.